Nicholas Lachester Fairley (born January 23, 1988) is an American football defensive tackle for the New Orleans Saints of the National Football League (NFL). He played college football for Auburn University, where he was recognized as an All-American and was a member of a BCS National Championship team. Fairley was drafted by the Detroit Lions in the first round of the 2011 NFL Draft. He has also played for the St. Louis Rams. Fairley was born in Mobile, Alabama. He attended Williamson High School in Mobile, where he was a two-way lineman and also lettered in basketball. Regarded as a three-star prospect, he was projected as an offensive guard. He committed to Auburn, but could not qualify academically. Fairley attended Copiah-Lincoln Community College from 2007 to 2008. After being redshirted in 2007, he played in seven games in 2008. He recorded 63 tackles and seven sacks. During the 2011 BCS National Championship Game against the Oregon Ducks, Fairley had five tackles, a sack and a forced fumble. Three of his tackles were made behind the line of scrimmage. Fairley was selected as the defensive player of the game award. Only four days after the 2011 BCS National Championship Game, Fairley decided to forgo his final year of eligibility, entering the 2011 NFL Draft. He was initially projected to be the first pick in the draft. His measurements at the combine showed him to be 6 feet 3 7/8 inches tall and 291 pounds, somewhat less than his listing of 6-5 and 300 pounds at Auburn. After the combine, he was projected in the 8-12 range. Fairley was drafted by the Detroit Lions in the first round as the 13th pick overall. 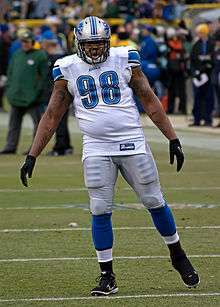 Fairley signed a 4-year contract with the Detroit Lions on July 28, 2011. The contract was 4-years worth $10 million with a $5.7 million signing bonus. In Detroit he joined All-Pro Ndamukong Suh on the interior of the Detroit defensive line. Though at times his play was stout, he was troubled by inconsistency. On March 13, 2015, Fairley signed a one-year, $5 million contract with the St. Louis Rams. Fairley played in 15 games for the St. Louis Rams in 2015 along their defensive line rotation and recorded a career-high 63 tackles (31 solo), a split sack, two passes defensed and one fumble recovery. On December 31, 2015, Fairley was placed on injured reserve. On March 28, 2016, Fairley signed a one-year, $5 million contract with the New Orleans Saints. 1 2 Mandel, Stewart (January 7, 2011). "Slowing Newton won't be easy, but stopping Fairley equally daunting". SI.com. ↑ "Auburn Tigers' Nick Fairley to enter NFL draft". ESPN. January 14, 2011. ↑ McShay, Todd; Weidl, Kevin (February 26, 2011). "Nick Fairley smaller than expected at NFL combine". ESPN Insider. ↑ Lande, Russ (March 2011). "NFL mock draft: Mallett, Liuget and Sherrod moving up draft boards". Sporting News. ↑ Dagger. "2011 NFL Combine Results". postgameheroes.com. Retrieved June 19, 2011. ↑ "Ndamukong Suh, Nick Fairley providing stout presence in the middle of Detroit's defensive line". 2013-11-13. ↑ Smith, Michael (November 12, 2013). "Fairley makes big plays, but Schwartz wants to see it consistently". ↑ Rogers, Justin (December 19, 2012). "Detroit Lions place DT Nick Fairley on injured reserve, sign Ogemdi Nwagbuo". mlive.com. Retrieved December 19, 2012. ↑ Birkett, Dave (October 27, 2014). "Nick Fairley out 4-5 weeks with knee sprain, per report". Detroit Free Press. Retrieved October 27, 2014. ↑ Wesseling, Chris (March 13, 2015). "Nick Fairley leaves Detroit Lions for St. Louis Rams". NFL.com. Retrieved March 13, 2015. ↑ Alper, Josh (March 13, 2015). "Nick Fairley signs with Rams". Retrieved March 13, 2015. 1 2 "Saints sign DT Nick Fairley to one-year contract". www.neworleanssaints.com. Retrieved 2016-03-29. ↑ "Rams place Nick Fairley, Doug Worthington on injured reserve". Retrieved 2016-01-01. ↑ "New Orleans Saints reach deal with DT Nick Fairley". NFL.com. Retrieved 2016-03-29. ↑ "Nick Fairley Stats". ESPN. ESPN Internet Ventures. Retrieved 29 April 2015. ↑ "Detroit Lions' Nick Fairley arrested on drug charges". CBS News. ↑ Seifert, Kevin (December 4, 2012). "Nick Fairley has drug charge dropped". ESPN. Retrieved December 4, 2012. ↑ "Report: Nick Fairley arrested again". ESPN.com. May 27, 2012. Retrieved May 27, 2012.